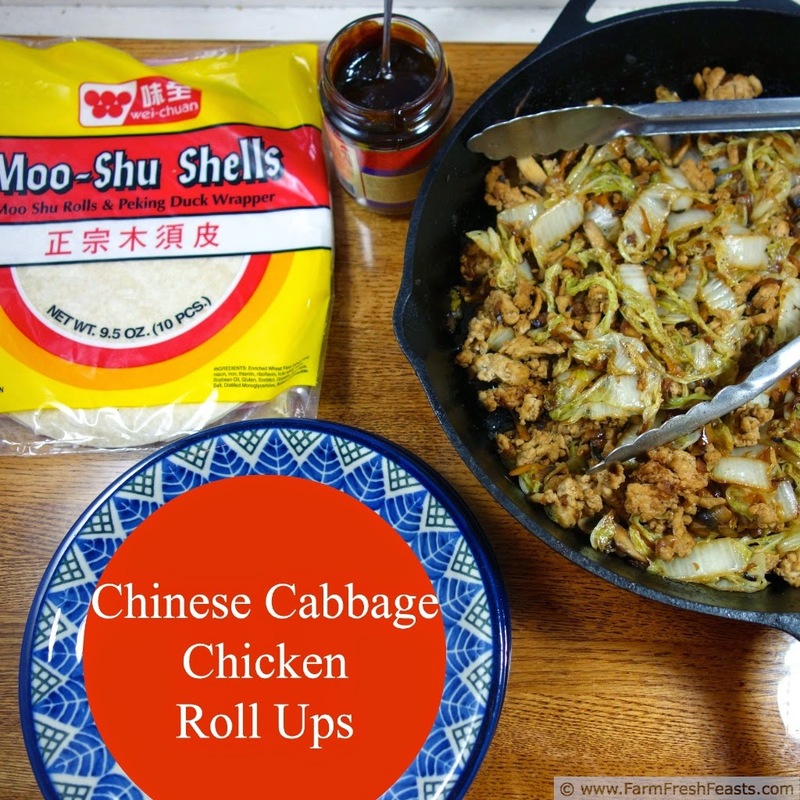 Ground chicken, Chinese cabbage, and mushrooms with hoisin sauce, rolled up Mu Shu style. This recipe can be served to vegetarians and omnivores alike because the meat is cooked separately from the vegetable filling. This is a good meal to fix if you're serving non-meat eaters as well as meat eaters, as the chicken is cooked separately and could even be left out altogether. I could call this a faux Mu Shu style dish but I really don't want the Mu Shu Police on my case, so let's just go with this title. I had a lovely Chinese cabbage, carrots, and onions from the Community Supported Agriculture (CSA) farm share. Ground chicken was marked down, and I'd made a trip to the CAM International market because was sled hockey season. When you have nearly all the ingredients for a Mu Shu, why not make something close to it? To make this Fast from the Farm Share I opted to have 2 skillets going, but if you'd prefer to do fewer dishes and have more time to spend making dinner, have at it. 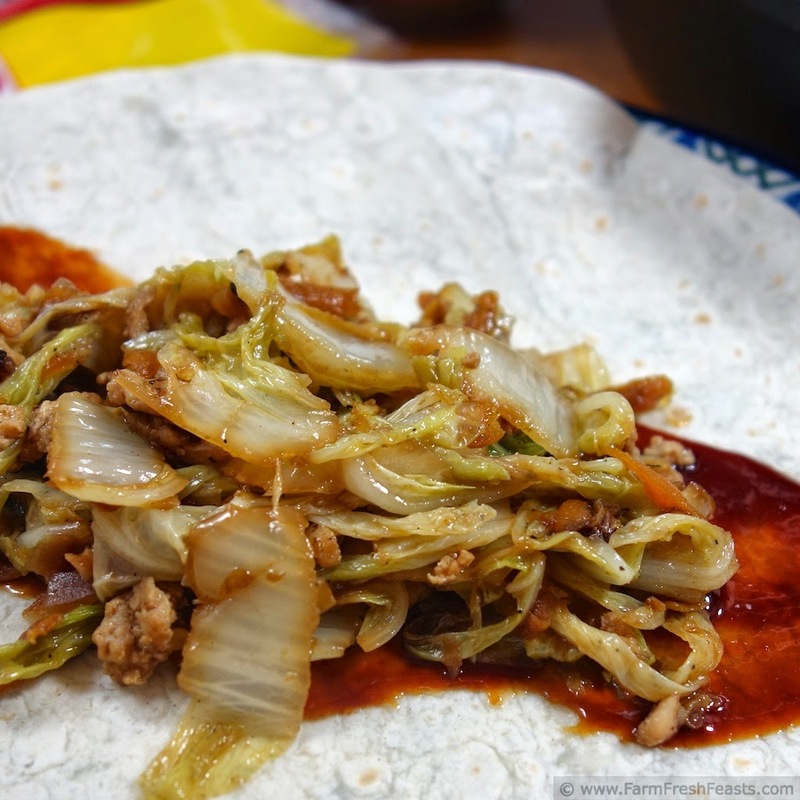 For more recipes using Chinese cabbage, please see my Cabbage Recipes Collection. For more recipes using mushrooms, please see my Mushroom Recipes Collection. These collections are part of the Visual Recipe Index by Ingredient, a resource for folks like me eating from the farm share, the farmer's market, the garden, the neighbor's garden, and great deals on ugly produce at the grocery store. Preheat a large skillet over medium high heat and a medium skillet over large medium heat. Add a turn of cooking oil to both skillets. 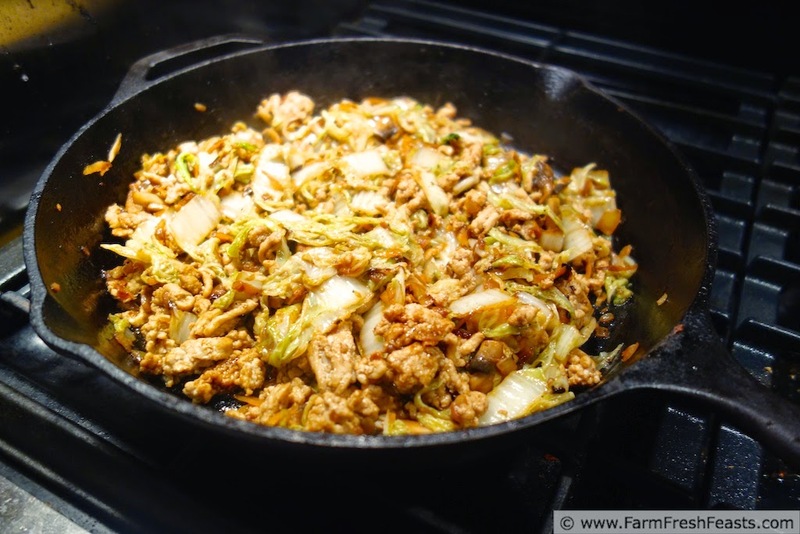 Throw the onions into the large skillet and give them a stir to coat with fat while you are prepping the other vegetables, then add the cabbage to the onions. In the medium skillet brown the chicken, stirring to break up the meat into small pieces. When the cabbage and onions are soft and starting to brown, about 7-8 minutes for me, push them to the edges of the skillet and add the mushrooms to the center. Sauté until the mushrooms give up their juice, 3-5 minutes for me, then add the carrots on top of the mushrooms. Stir to combine all the vegetables together, then add hoisin sauce over top and stir thoroughly. Note: If you're serving all omnivores, add the chicken to the vegetable mixture now. If you're serving both vegetarians and omnivores, add the additional hoisin sauce to the chicken and stir thoroughly. Warm the mu shu shells according to package directions. 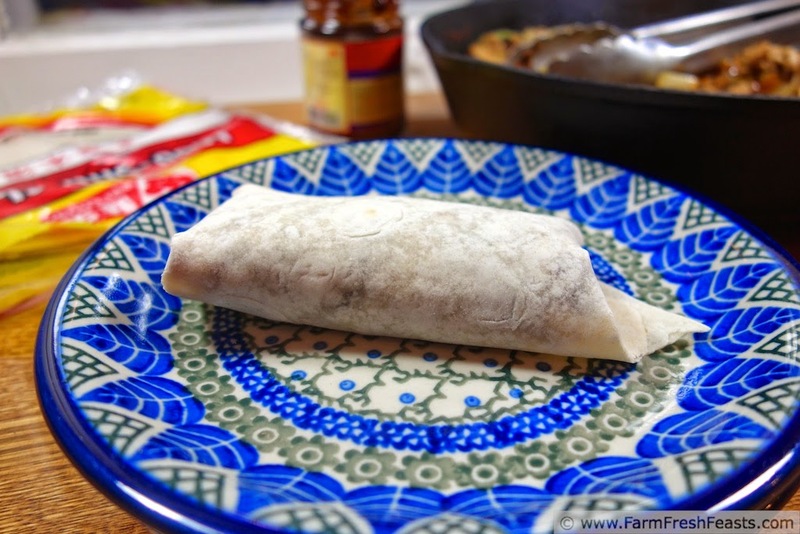 Spread a teaspoon or so hoisin sauce down the center of the shell, add ½ cup filling, fold up like a burrito--any burrito folding arguments you're on your own--and serve. You know, I haven't intended to share so many photos of the dogs lately, but I keep finding them labeled with the recipe since the dogs were not . . . sharing nicely. 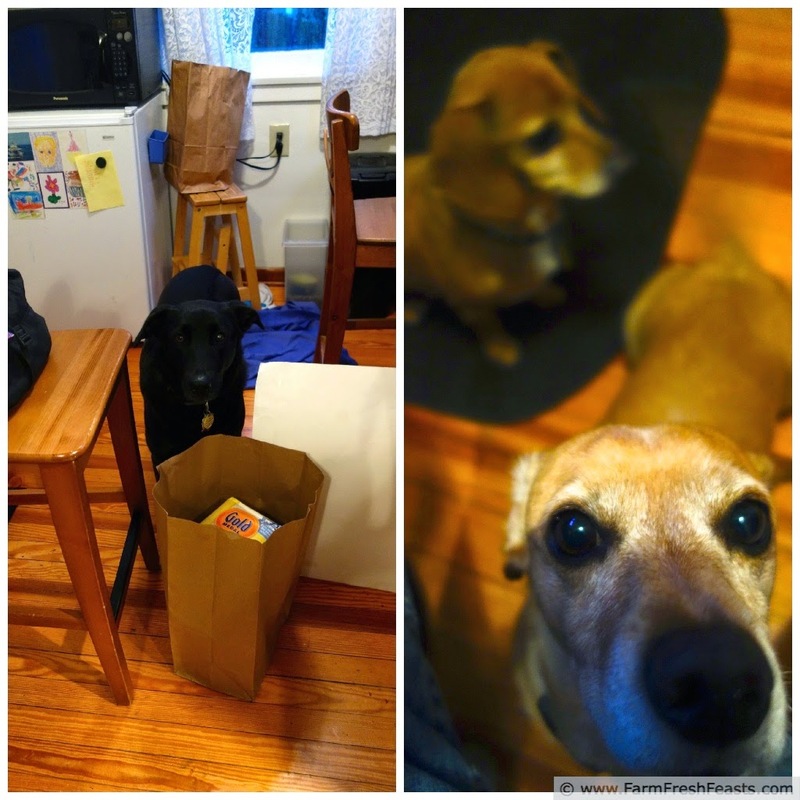 Or rather, Vincent was trying to share Simon's food--and Simon was pansy enough to let him until I set up a barricade, then he was just confused as to why he was being punished, blocked off with his food and water. Whatever. Vincent is very happy to love me, though, and let me know that even though I blocked him from the big food bowl he has no grudges. Oliver? Sweetly oblivious. As usual. Here you go making abbage look hot yet again. To think lasy year, I only knew how to make coleslaw and even then, not very well. You amaze me, and I love seeing the pictures of the pooches. Keep 'em coming. So many blistering typos. Eek. *hangs head in shame. I love making this type of filling, and I use it in everything: tortillas, eggroll wrappers, slider buns. Ah, Lydia--slider buns. After my heart! I'm a sucker for small food. Great recipe, Kirsten! I have a bunch of bok choy from my farm share. I may try that in place of the cabbage. Thanks for the idea. Yum, bok choy! I'm positive that would be great in this recipe as well. Any cooking green--and I always forget bok choy, so I appreciate the reminder. I'm working on a concept recipe for a future post and that's so useful to remind me.